No. 24 Notre Dame traveled to Cathedral City, Calif., this weekend for a six-game slate against west coast competition at the Mary Nutter Collegiate Classic. The Irish won four of six games over four days, including three shutout wins and a 12-11 thriller over UC-Davis, though the weekend culminated in a nine-inning, 2-0 loss to No. 6 Oregon Sunday. On Thursday, the Notre Dame staff tossed 14 shutout innings to earn a pair of victories over Pacific (3-8) and Brigham Young and stretch the winning streak to seven games. In the afternoon game against Pacific, the Irish bats remained silent until the bottom of sixth inning, when they manufactured the game’s only run. Junior second baseman Jenna Simon recorded an infield single, stole second base and moved to third on a sacrifice bunt by junior center fielder Emilee Koerner. Freshman left fielder Karley Wester made the most of the scoring chance with a sacrifice fly to left. 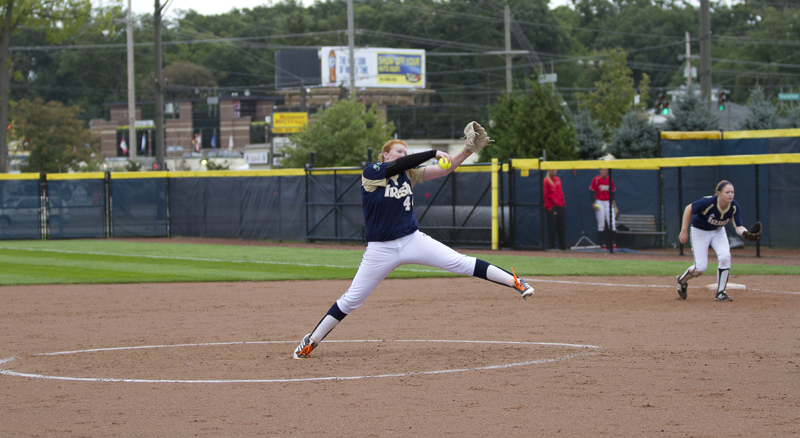 Freshman pitcher Rachel Nasland, who replaced sophomore pitcher and starter Allie Rhodes in the sixth inning, earned the first win of her Notre Dame career (1-0). In the second game, senior pitcher Laura Winter, fresh off her selection as one of 30 candidates for the 2014 Senior CLASS Award, gave up just a pair of singles and a walk and recorded eight strikeouts against BYU (6-9). Senior righthander Laura Winter pitches in an exhibition game against Illinois State on Sept. 15. Winter recorded eight strikeouts against BYU on Thursday. Irish coach Deanna Gumpf said her team’s pitching is emerging as a clear strength. The Irish played just one game on Friday and earned an eighth consecutive win in a wild 12-11 victory over UC-Davis (5-13). The Irish ran out to a 10-3 lead behind a torrid offense. Koerner hit her third leadoff home run of the season, and Winter, junior third baseman Katie Haus and sophomore first baseman Micaela Arizmendi added two RBI each. However, the Aggies clawed their way back into the game when a three-run home run by senior catcher Caitlin Voss tied the game at 11 before Wester scored the game’s winning run for the second time in as many days, coming home on an errant throw from short. On Saturday, the Irish battled but ultimately lost to California 5-3 before earning a third shutout of the weekend against Cal State-Fullerton, 8-0. Against the Golden Bears (7-6), a three-run home run courtesy of Arizmendi brought the game back within striking distance in the seventh and final frame, but a pair of popups ended the chance and the Notre Dame win streak. However, the Irish bounced back against Cal State-Fullerton (11-5). Laura Winter tossed her second shutout of the weekend, giving up just one hit and striking out seven and allowing zero walks. The victory was her 89th moving her into third place on the program’s all-time victories list. The weekend’s final game came as the biggest test in the young season so far for the Irish, against No. 6 Oregon (13-1). Notre Dame fell just short of a potential statement win in a 2-0 nine-inning loss, handcuffed by Ducks’ sophomore pitcher Cheridan Hawkins (7-1), who threw 150 pitches and yielded just three hits. Winter threw eight more scoreless frames for Notre Dame, but was ultimately dealt her second loss of the season (6-2). Still, Gumpf said there was plenty to be taken from the heart her team showed. The Irish are back in action this weekend at the Diamond 9 Citrus Classic at the ESPN Wide World of Sports complex in Kissimmee, Fla. Action begins Friday at 1:15 p.m. against Fordham.